Extravagant is the perfect word to describe Weddings in Gurgaon and Delhi. If you ask us Mumbaikars, every Delhi wedding is a big fat Indian one. Delhi folk really know how to party, how to party hard, and how to party in style! We all agree that nothing beats the high-spirited (literally!) bridal party, bands, designer bridal couture, gaana-bajana, khana-peena and endless lavish spreads of gastronomical delights (the list is endless) at a Delhi wedding. Ultimately, your entire wedding planning zeros down to the perfect wedding venue selection. Having your wedding at an exotic destination is definitely on every couple’s wish-list. While some might be super-duper excited to make this a memorable event, going all out to a different destination, some like to keep it intimate, elegant and stick to their hometown. With Gurgaon offering the finest selection of wedding venues, why go anywhere else. Months leading up to your wedding, if you still haven’t found the dream venue to have you big-fat or on the contrary classy and intimate Delhi wedding, this listing will ‘pukka’ come handy. The Westin Gurgaon is the kind of one-stop-lavish-destination where you could get hitched without a glitch. In addition to having bucket loads of spectacular amenities, this hotel lets you choose from their three tastefully designed venues where you could exuberantly hold your pre-wedding and wedding festivities. Their Vatika Ballroom can be combined with the lawn allowing you to host a beautiful outdoor ceremony and indoor reception or vice versa at your own discretion. Highlights: Distinct décor, tailor-made floral arrangements, customised menus and live cooking stations. Find pricing and more details here. Wish to get married under a starlit sky? The Leela turns your dream into a reality that will make you pinch yourself twice to believe it. If a terrace wedding is not how you like to roll and you wish to stick to a conventional banquet reception, The Leela can suitably accommodate the nuances of those wedding requirements too. Highlights: Exclusive entry for baraat, arrangements for procession on a private road, customised menus by culinary experts, creative decorators and rocking DJ service. If glitz and glam is what defines your taste in weddings, Le Meridien could be the most ideal selection to up your #shiz quotient. You can choose from their meticulously designed ballrooms or enjoy a scenic view of the Aravali Range from its terrace venue. Either way your celebration is going to be a memorable celebration. Highlights: Exceptional decors and lighting, themed menus, signature desserts, live cooking stations and in-house wedding specialists to tend to all your details. Are outstation guests attending your wedding? Want to give them a glimpse of the major attractions in and around Delhi? Crowne Plaza is what you should book right away! What’s the hurry, you may ask? 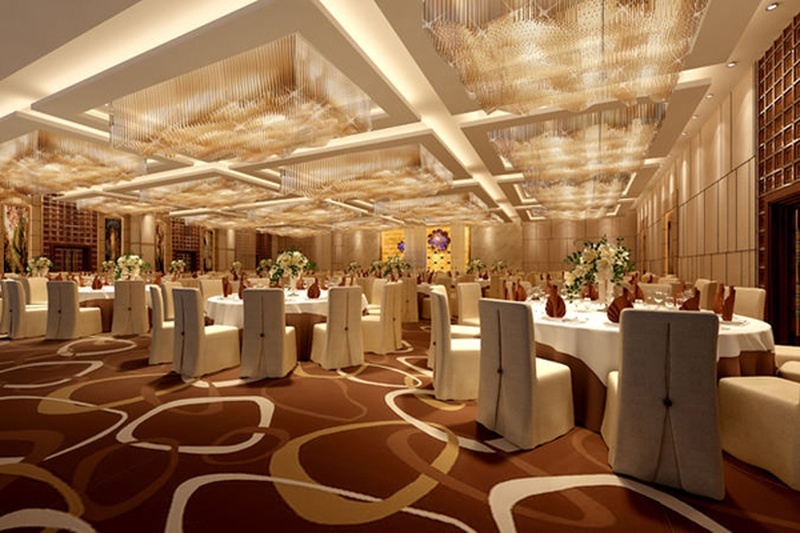 Located in the hub , this banquet hall in Gurgaon Crowne Plaza the most sought after by any and every one who has the thoughts of getting married running on the back of their head. With shimmery and stylish venues at your disposal, there is no way this venue can escape your wish list. Highlights: Culinary experts, creative decorators and rocking DJs. Imagine getting married at a rooftop space that looks like a lawn. Something else isn’t it! Galaxy Hotel promises to give you an outstanding experience and stands true to its words by offering venue spaces that redefine wedding celebrations. Their terrace venue is perfect for an intimate wedding or pre-wedding functions, while their palatial ballroom can easily accommodate a large gathering. Highlights: Well-stocked bar (who doesn’t love that), majestic interiors and exteriors, and multi-cuisine food options. If your wedding guest list is the one that is not just big-fat, but humongous, this banquet hall in Gurgaon Hyatt Regency will help you host a wedding like nobody’s business. Ensuring each and every guest of yours is well attended, their super-large pillar-less ballroom can easily house all your guests and keep them entertained throughout. Highlights: In-house décor services provided by Ferns & Petals, hall can be combined with the lawn to accommodate more than 3000 guests and you can book your own DJ with no royalty applicable. The Pllazio Hotel is where weddings meet luxury, luxury meet comfort, comfort meets convenience, and we can go on and on and on. With just one glance at the venue, MJ’s famous dialogue “This is it!” might just spurt out of your mouth. Whether you pick their hall or terrace venue to celebrate your union, The Pllazio Hotel will simply blow your mind. Highlights: Breathtaking lighting and interiors, state-of-the-art audio-visual support, offsite catering and in-house event coordinators. If you’re the kind of couple who dislikes (or hates) the idea of big fat Indian weddings and likes to keep celebration small and tiny, in other words close and intimate, your hunt for the perfect wedding venue stops here. Optimally located in the heart of Gurgaon, Optus Sarovar Premiere leaves no stone unturned to ensure your wedding receives a keen eye for attention to minute details of your celebration. Highlights: Aesthetically designed interiors, culinary experts who serve lip-smacking cuisine and the venue lets you hire your own decorator and DJ. So, there you have it. Go, get married away!